We (Janis, Jelena, Constantinos and Iyad) have come back from SIREN (Jonköping 12-13 May) with great impressions. 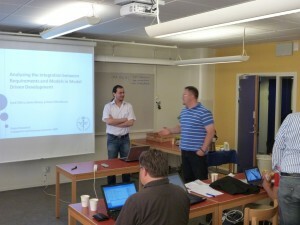 The seminar jointed a number of Swedish universities doing research in the Requirements Engineering discipline (Lund, Blekinge, Jonköping, Linköping, Skövde, Malmö, DSV/Stockholms Universitet, KTH, Chalmers). Also there were industrial participants from Volvo, SAAB, Ericsson and Qtema. Both the given presentations and the discussions were of a high quality and fruitful. Our crew presented two PhD research efforts, one on modelling Business Strategy for aligning with RE (Constantinos), and the other related to an integration of RE with MDD (Iyad). For them we got a very positive feddback, from both the academy and the industrial particpants. DSV team (from right to left) – Janis Stirna, Jelena Zdravkovic, Constantinos Giannoulis and Iyad Zikra on the way back from Jonköping. This entry was posted in At DSV, Conference, Enterprise Modelling, Event, Information Systems, Location, Media Content, Networking, Outside DSV, Photo, Profile Area, Risk and Decision Analysis, Specific Area, SYSLAB, Unit. Bookmark the permalink.